1. 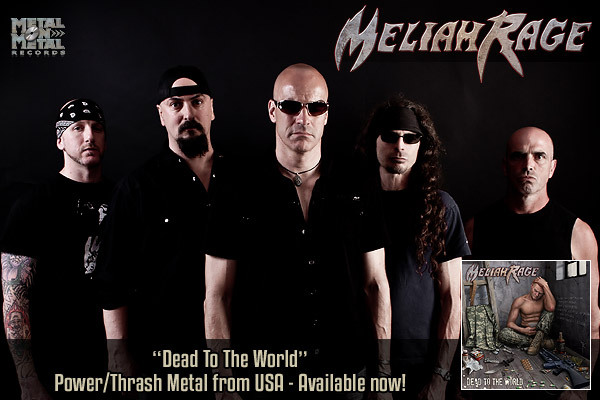 Meliah Rage did not have a steady course since its formation in 1987 to these days. Lots of line-up changes, several record labels, change in musical style, etc. When you look back, how do you see 25 years of Hard ‘N’ Heavy over your shoulders? Wow... 25 years! Who would have thought! Well, it would certainly be tough to keep any band together for 25 years without lineup changes... even the wealthy ones! I will say I/we have always made it a point to have at least three original members on any record we've ever done. Bands like Iced Earth, Anthrax, Metal Church, Exodus, Overkill, Testament and many others have done records with only 1 or 2 original members which to me at some point takes away from the legacy of the band. I put the number of having 3 original members or we wouldn't do a record. Again 25 years of making metal without making much money at it would be nearly impossible to keep all members for that amount of time! As far as style change goes, being the primary music writer and arranger I just write what I feel. Of course our second vocalist Paul Souza brings a different vocal vibe to the table. Mike Munro was more Hetfield-ish and Paul is more melodic. They also write what they feel so it is what it is... A record sounding like our 1988 debut "Kill to Survive" probably isn't going to happen. 2. New record, new label. “Dead To The World” was released in July 2011 through Italy’s Metal On Metal. How did the collaboration with this independent label take place and how is it going so far? Metal on Metal contacted us after noticing our 'at the time' label wasn't doing their job. That label was on its last leg and did absolutely nothing to promote 2009's "Masquerade". We were just about ready to start searching for a label but after a few emails and calls from Metal on Metal there was no need. How is it going? The label... Absolutely great. They're quite simply the best, most thorough, in touch with their genre, hard working label we've dealt with since Epic! Jowita at the label will give her feelings on the music, my bad spelling, photos or just about anything we present to her... That's a good thing! She cares!!! Meliah Rage members, all being our 40s, we have other things going on and I wish we could give the effort and time the label does! 3. After more than a year apart from the release, what’s the balance in terms of reactions from the press and fans? What about live shows? For the most part the reaction has been positive, but of course not everyone is going to like a new record without original frontman Munro. I will say a lot of the reviews seem to compliment the guitar work which I will always be proud of... that's what I do and if someone likes it that's cool! Only one show booked so far. Next summer in Ohio at the Warriors of Metal festival. 4. The lyrics are always an important part of Heavy Metal. Would you like to highlight and explain some of the lyrics in “Dead To The World”? I'm not the lyrics writer so it's hard for me to give an explanation of the lyrics. There is no doubt that they have a dark tone to them. Paul was going thru some tough times when the record was being recorded and if you dig in you can see that! 5. Playing this type of traditional Hard ‘N’ Heavy, which is not trendy or commercial, what are your thoughts on the current Hard ‘N’ Heavy scene? Are there any new bands that you like or you just stay faithful to the old school stuff? Funny you ask! I went to a club the other night to see a younger friend's band. There were 4 bands and they all had that newer type of singing. Not my cup of tea but they were all good at what they did. It's all generational. I remember older metal fans thinking thrash was unlistenable when Metallica and Megadeth were starting making waves in the mid '80s. They would say that singing is terrible... well now my generation is saying that about newer bands. Bottom line, if you're good at what you do that's all that counts! What I like? Classic Metallica, Megadeth, Slayer, Arch Enemy, Queens of the Stone Age, AC/DC, Riot (Guy Spuranza records), Krokus "Harware" (not much of their other stuff), old Scorpions, Stones '67 to '72... etc., etc. 6. What are your plans for the nearest future? I have been working on a side project with Jon Hardy who is the singer/bassist from the indie band The Bags. The project is called MEXICAN APE-LORD and so far so good. It will sound a bit like Meliah but with a few different twists. Stay tuned! 7. Thanks a lot for your time. Do you want to leave a final message to the Portuguese Metal fans? Well, thanks for reading this if you made it this far!